After a successful Saturday, the second day of the International Final was soon upon us. Those that camped at Rockingham were greeted with a crisp and bright autumnal morning at the track. Teams started to arrive and the buzz in the pits was at an all-time high. Every single team had earned their place to be at the Final, and every team were ready to go racing for the last time this season. The day started with a practice session, which gave teams a perfect opportunity to get both their set up and drivers dialled in to the track. The practice session was closely followed by our Formula 24 Parade, a tradition that we have honoured at our new venue. 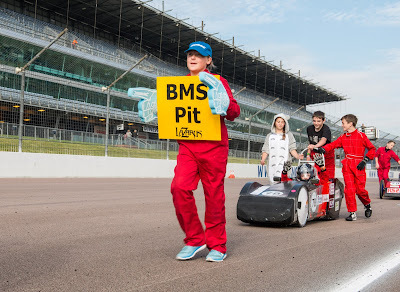 Every qualifying team proudly marched down the start/finish straight with their cars, waving flags and with team mascots such as Bromsgrove School's Chicken and Status Racing's pit penguin Headwig in tow. Much like a typical heat, the racing started with the first of the two IET Formula 24 races. Due to the volume of entrants and the length of the track, the race was started with a rolling start lead by the stunning BMW i8. Once the BMW i8 had passed the start line, the race was on. 2014 Champions, The Weald School had made a rookie error forgetting to turn their isolator on, which meant they managed to cruise to turn 1 and had to pull off the track, not the kind of start the champions were after. RLR 2 from Richard Lander School found themselves climbing from their qualification place of 7th up to 2nd place, a fantastic achievement for RLR 2's debut season. The race was led by Chipping Sodbury's Rotary Racer which crossed the finish line taking 1st position in Race 1. With 75 cars competing, very few cars finished in their starting position on the grid. The Kit Car Final winners Retro Rocket continued with their winning streak placing as the highest kit car team in race 1. There were some fantastic performances throughout the field. For example, Power Pak: Hilibre High School Humanities College started in 70th but finished in 28th position. The champion of 2015 was to be decided in Race 2. The second race of the day was the 10th round of the IET Formula 24+ Championship and the Silverline Corporate Challenge. The 2015 F24+ season has been one of the best seasons to date, with extremely close racing and record-breaking numbers of entries to the championship. Jet from Cullimore Racing and Reprobation from Renishaw Plc both entered the final round of the season on equal championship points, so it was all to play for. Jet had not managed to beat Reprobation in the Lap Race held on the Saturday of the International Final weekend, but was it a tactical move? When the Union Flag was waved from the gantry by representatives Silverline Tools, the 40-car grid pulled away under their own power and started to make their way around the track. Jet II emerged first at turn 4, followed by Jet then Reprobation. Reprobation soon overtook the 2013 and 2014 championship winner, Jet, and was stalking Jet II, just waiting for the chance to overtake. This could give the team a fantastic hat-trick of titles - F24+ Race Winners, F24+ 2015 Champions and Silverline Corporate Challenge winners. Electric TubeofGlue from weCHOOK Racing, a car that had some solid podium finishes in the latter part of the season, found itself in 11th position and in a Renishaw sandwich, in-between REC - 349 and Probation IV. After having some issues in Saturday's Lap Race, GP14.EVO from PSEM managed to keep half of the field behind them with their consistent lap times and improved reliability. The end of the race was nearing and with just 5 minutes to go, Reprobation finally managed to overtake Jet II - what a fantastic end to the 2015 season! 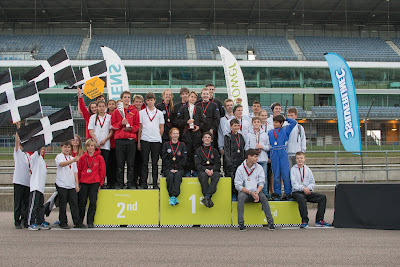 Whilst the celebrations were going on in the Renishaw pit, it was time for the second IET Formula 24 race of the day. Lots of teams had been furiously working on their cars during the F24+ race so that they could improve on their performance from the first race. After the BMW i8 safety car passed the start line, the flag dropped and all the competitors were racing for the final time this season. Chipping Sodbury's Rotary Racer put in a fantastic final show, equalling it's first performance of the day completing 44.1 miles in 90 minutes and confirmed their 2015 champion status. Sandbach School's newest car Dylan managed to fight off competition from The Purple Predator and RLR 2 to place on the second step of the podium. The top 5 had a bit of a shake up from Race 1 as Terazord from Bristol Grammar School swooped into 5th place, which was a massive improvement from placing 23rd in Race 1. Kit Car Champions sadly didn't replicate their earlier performance in Race 1, being beaten to the highest placing Kit Car by FR-7K from Foremarke Hall. Both cars from the Grampian Transport Museum team, Alford Spyder and Alford Bullet, also massively improved their performances, starting in 44th and 55th and finishing in 13th and 14th. So the 2015 season has finally come to a close with new champions in each category. 2015 has been an amazing season for Greenpower, and we hope that you have all enjoyed it as much we have! We hope you all have a fantastic off season, we would like to see lots of new scratch-built cars in 2016! 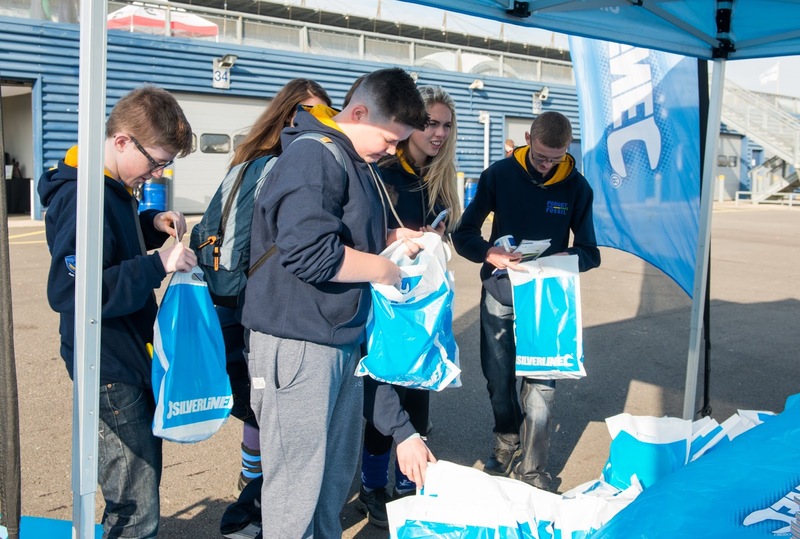 We would like to thank our major partners, Siemens, The IET & Silverline, for supporting us throughout the 2015 season. This is one of the most astonishing venues that I've attended for my numerous experiences. This place is spot on with the decorations. The overall experience from venues in NYC was amazing! Had a fun and comfortable time here.